Stront is so annoying. It bugs me almost more than anything else I move. It is deceitful. I have half of a cargo open on my Rorqual. It holds 4k units of stront. That is nothing. What an irritating, frustrating material it is! My moving status is still, not all that moved. I've gotten bits and pieces done here and there. The tower up and running. the TCS alts moved. TCS's loose things moved although it hasn't been restocked yet. However, I'm somewhat fascinated inbetween the apalled horror, at how hard it has been for me to move myself this time. But, I'm getting stuff done. I finally shoved my carrier full of spaceships and made the jump. While I was staring at my cynos screen I found myself wondering why there were little red houses on my screen. I looked at my overview and went, "Oh. Seekers." Okay. 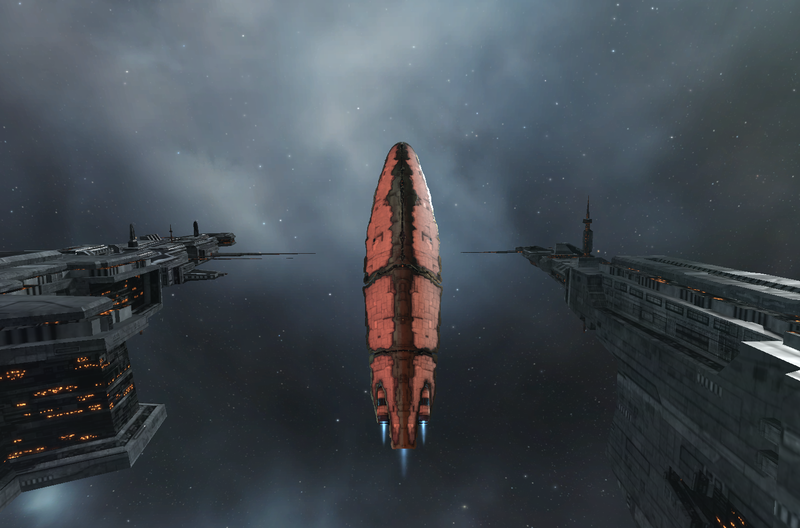 Propelled by all of my amazing energy I managed to jump my Rorqual and Thanatos and actually move some things. I put some builds on and slowly shook off some of my dust. I was pretty pleased with myself until I undocked to a pink Providence. I was so shocked that I redocked to check it in the station where it was a normal color. I checked the sun. It is a white dwarf. It seems that this pink color is the reflection of the station lights? The station itself is blue gray. This was my adventures for today. Exciting stuff. Pink Providence? How very phallic it appears. And LOL @ little red houses! It's like getting attacked by mobile depots:some things will just take some getting used to. "There's a red house over yonder..."